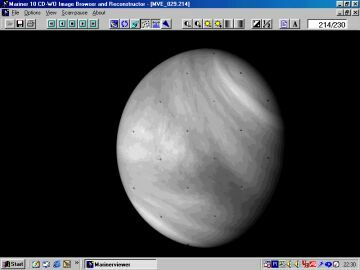 Program MarinerView was created for Mariner 10 Raw EDR Images in VICAR Format (PDS), volumes MVM_0001 to MVM_0015 CD-WO produced by the Science Digital Data Preservation Task. NSSDC data set ID: PSPA-00108, other data set ID: 73-085A-01U. This data set consists of the Experimental Data Records (EDRs) for the 12500 images obtained by the Mariner 10 TV Experiment.The EDRs consist of unprocessed instrument data in VICAR (Video Image Communication and Retrieval) format. Each image file consists 22 blocks containing 31944 bytes per block.The first logical record of the first block contains a single set of VICAR label information. The labels are followed by 700 logical records (one per image line) containing pixel data and engineering data. MarinerView is a Windows viewer for this data set. Mercury image before and after despeckle filter. 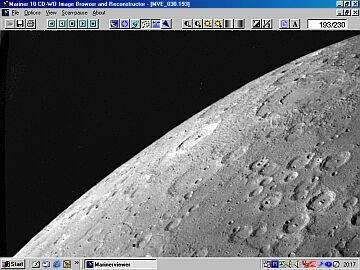 Mercury image before and after reconstruction (435000 pixels added). Venus UV image and Moon image. Overview of the Mariner 10 mission. The Mariner 10 mission was the first multiplanet mission carried out by a single spacecraft. In one flyby of Venus followed by three flybys of Mercury, Mariner 10 returned more than 12000 images to Earth. The primary goal of the Mariner 10 mission was to obtain data about Mercury, a planet that had never before been visited by a spacecraft. Mariner 10 was launched on November 2, 1973 atop the Atlas/Centaur rocket from Launch Complex 36B. Spacecraft was placed in a parking orbit after launch for approximately 25 minutes, than placed in orbit around the Sun en route to Venus. The orbit direction was opposite to the motion of the Earth around the Sun. The spacecraft passed Venus on February 5, 1974 at a distance of 4200 km. It crossed the orbit of Mercury on March 29, 1974, at a distance of about 704 km from the surface. A second encounter with Mercury occured on September 21, 1974, at an altitude of about 47,000 km. A third and last Mercury encounter at an altitude of 327 km, with additional photography of about 300 photographs occured on March 16, 1975. Engineering tests were continued until March 24, 1975, when the supply of attitude control gas was depleted and the mission was terminated. The television system centered around two vidicon cameras, each equipped with an eight-position filter wheel. The vidicons were attached to telescopes mounted on a scan platform that allowed movement in vertical and horizontal directions for precise targeting on the planetary surfaces. 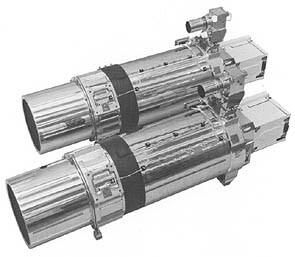 These folded optics (Cassegrain) telescopes were required to provide narrow-angle, high-resolution photography. An auxiliary optical system mounted on each camera allowed the acquisition of a wide-angle, lower-quality image. Changing to the wide-angle photography was done by moving a mirror on the filter wheel to a position in the optical path of the auxiliary system. In addition to wide-angle capability, the filter wheels included blue bandpass filters, ultraviolet polarizing filters, minus ultraviolet high-pass filters, clear apertures, ultraviolet bandpass filters, defocussing lenses for calibration, and yellow bandpass filters. A shutter blade controlled the exposure of the 9.8- by 12.3-mm image face of the vidicon for an interval that could be varied from 3 msec to 12 sec. The light image formed on the photosensitive surface of the vidicon produced an electrostatic charge proportional to the relative brightness of points within the image. During vidicon readout, an electron beam scanned the back side of the vidicon and neutralized part of the charge so as to produce electric current variations proportional to the point charge being scanned at the time. These analog signals produced from the vidicon readout process were electronically digitized as 832 discrete dots or picture elements (pixels) per scan line, and presented to the flight data system in the form of 8-bit elements for transmission. Each TV frame-one picture-consisted of 700 of these vidicon scan lines. All timing and control signals, such as frame start, line start/stop, frame erase, shutter open/close, and filter wheel step, were provided by the systems on board the spacecraft. Very soon after launch, the planet-viewing experiments were turned on, a first time for planetary missions. The aim was to calibrate the instruments in the well-known environment of the Earth-Moon system. First TV pictures of Earth were obtained 16 hours and 15 minutes after liftoff. In all, Mariner 10's cameras provided a series of five Earth mosaics within the first few days of flight. These mosaics revealed intricate cloud patterns at about the same resolution expected during the Venus flyby. The Earth pictures could provide valuable comparisons with the Venus clouds. 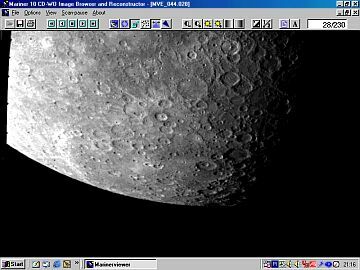 As it passed the Moon, Mariner provided views of the north polar regions. Mariner 10's cameras provided a series of	six mosaics of the Moon. The path of Mariner allowed images to be obtained of the north polar region of the Moon, which, because of constraints on paths of other space vehicles, had previously been covered only obliquely. In February 1974 at a minimum distance of 5785 km from the surface, Mariner 10 flew by Venus, accomplishing a series of studies and, simultaneously, a perturbation maneuver in its gravitational field that assured a continued flight to Mercury. 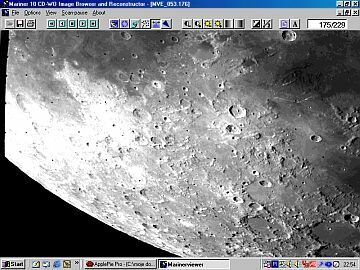 On March 23, 1974 Mariner 10 began photographing Mercury, and by April 3 it had collected an unprecedented store of scientific data, including more than 2000 high-resolution television pictures. Mariner 10 was placed in a orbit around the Sun that returned the spacecraft to Mercury twice more at a six-month intervals. some amount of noise. The random noise is usually due to telemetry errors. Most of Mariner 10 images contain only 25 percent pixels. Rest of pixels contain zero value. See reconstruction examples for details. only the middle quarter of each frame could be sent back. Image processing - detailed view. This series of pictures shows how the MarinerView program cleans up errors in real-time pictures. The first picture in series shows fragment of original picture as received in real-time with a different bit error rate. 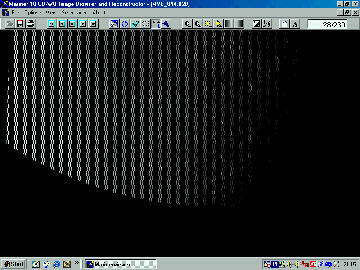 This same picture is shown after the MarinerView program detected and replaced pixels that were in error. It did this by averaging between the correct neighboring pixels that surrounded each pixel in error. Mariner 10 Image Processing Sequences. Mariner 10 Processed Image Gallery. Ultraviolet photographs of Venus showed surprising details of atmospheric patterns. These views of high and low latitude regions of Venus reveals spiral-like markings and streamline flows. These images was obtained in ultraviolet light to bring out details in the upper cloud layer, which appears very bland at visible wavelengths. High-resolution pictures, each only a quarter frame in effect problems with the tape recorder and transmitter, were obtained at the third encounter.